FLOOR 35 — ALREADY FINISHED! Construction of the residential complex Aquamarine is ongoing at a rapid pace ahead of schedule — instead of building a single floor in one week, we have been building it as fast as in 5 days! The number of builders at the construction site allows to complete the works not only with high quality, but also very quickly. We have no doubts that the project will be commissioned on time — in the 2nd quarter of 2020. As of today, 35 tower floors out of 44 are completed. By the end of autumn, in-situ concreting works are planned for completion, and then we move to the next stage — the facade! 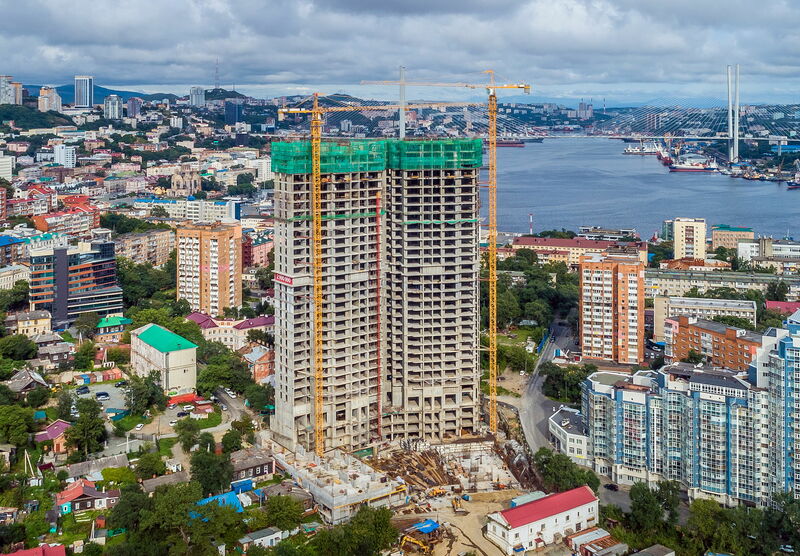 Even now, it is already possible to imagine how a 155.5-meter skyscraper rises above Vladivostok at full height, creating an entirely new outlook both of the coastline – due to its unique location, and of the city as a whole. Very soon, the dream of many citizens will come true. Please follow our news.